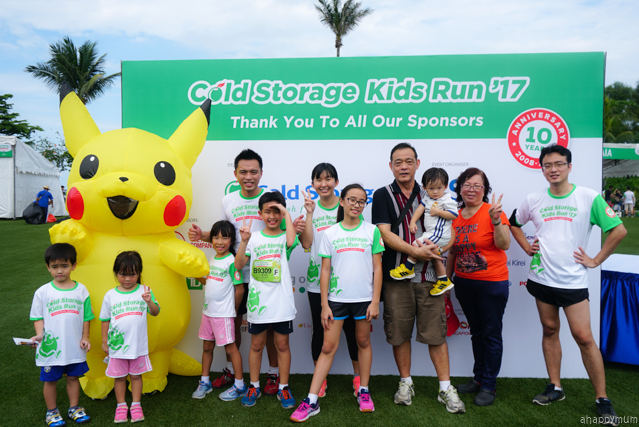 We were very much looking forward to Cold Storage Kids Run 2017, which was going to take place just a day before the hubby's birthday. 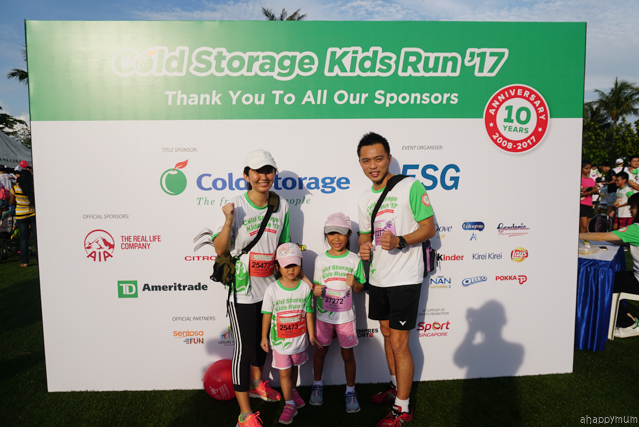 Unlike the run we did earlier this year where we could run as a family, for the Cold Storage Kids Run, the hubby and I would each pair up with one of the girls for their respective runs - which were categorised by age so they fell in different categories. Yes, that also meant we didn't let the toddler join in this year since his was going to be a stroller run (which might as well be called parent-carrying-toddler run) and we thought we would shine the spotlight on the sisters instead. On the day of the run, we rose early and everyone was in a chirpy mood and feeling thankful for the great, sunny weather. Oh wait, so where was the baby boy? 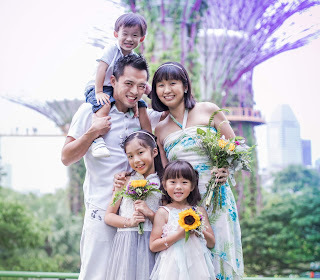 Yes, it was a great thing that our in-laws came with us so we could have celebration with the hubby at lunch later, but more importantly they helped us to jaga the littlest and allowed us to concentrate on running with the two elder ones. It's very rare for the baby to be away from me and honestly, it felt so long since we were a family of four and perhaps it was high time for me to spend some quality time with the girls without the presence of their super cute but super needy baby brother. 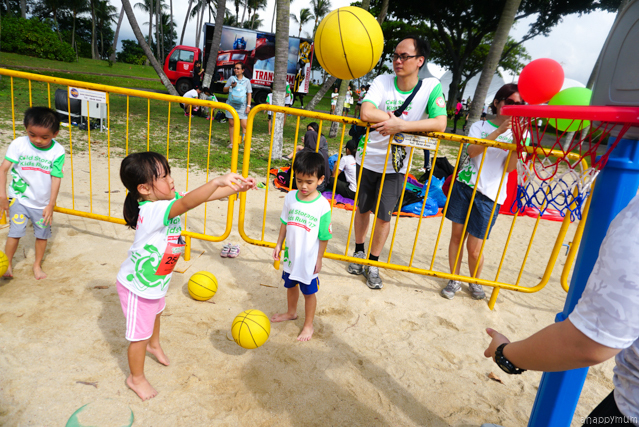 Held at Palawan Beach, the venue was very spacious this year and before the race started, everyone found a nice spot to wait while enjoying the bread and bananas which were being handed out to participants. Even when we gathered at the starting point for the flag off, it didn't feel so much of a squeeze as compared to previously and I was glad for the extra air and space we had around us. What was not so welcoming about the venue was the seriously long queue to enter the carpark and the seriously lack of parking lots! It was worsened by the fact that our runs were one of the latest to be flagged off so the carparks were all full by then. Thanks to the father-in-law who took over the steering wheel to go park in a more remote place, the four of us jumped out of the car and made our way to the event venue on foot since all the cars on the roads appeared to be moving at snail's pace. See the huge tentage set up for the participants? 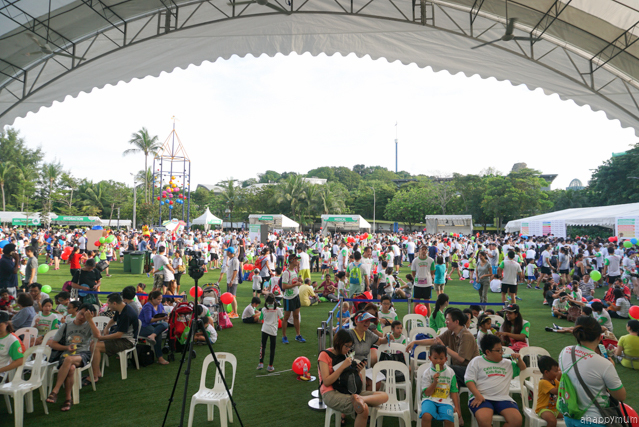 That was a very thoughtful gesture from the organisers and even though there were hundreds of fellow participants gathered together, we found a pretty nice grass patch to sit and gather for the rest of our morning. Not only were our in-laws present, the brother-in-law was also there with his three kids so the little ones were all very happy to be running, playing and having fun together. Yup, my girls adore their cousins to bits and it's nice that we meet up often because this always excites and makes them look forward to it. 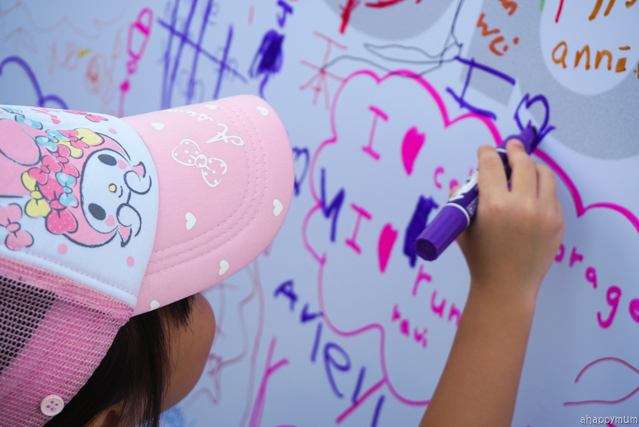 Before the run began, we asked the kids to pen down their wishes on the big board and seeing the words "I love running" was a great reminder to me on how taking part in these runs meant a great deal to the kids and the memories that we created with every run would last us for a long, long time. 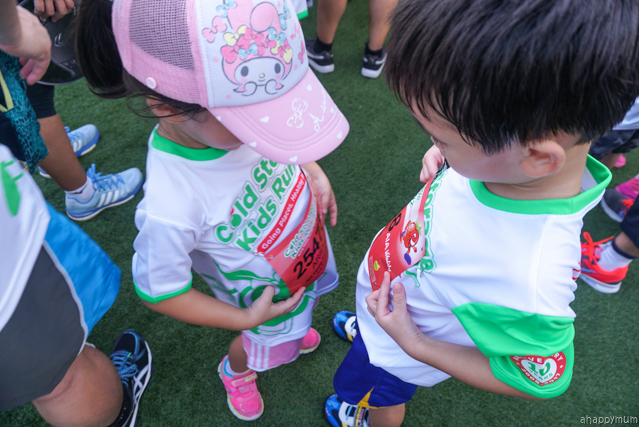 Our runs might not be competitive yet and while I know soon the girls will be running on their own without the need for parents to accompany, I actually think I will miss this feeling of running alongside my child and feeling how we bond, laugh, cheer and encourage each other to reach the finishing line. 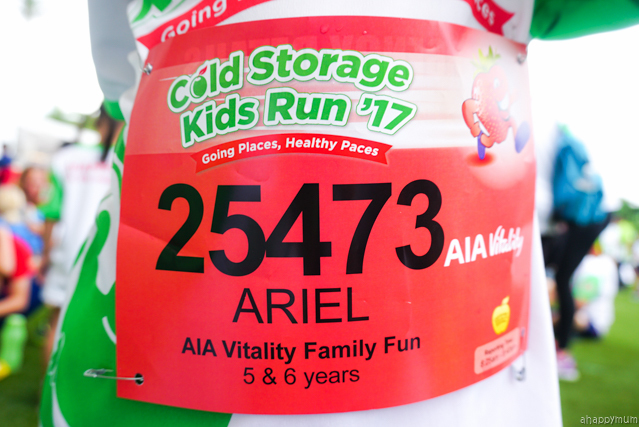 First up was Ariel's AIA Vitality Family Fun run (for 5 and 6 yos)! 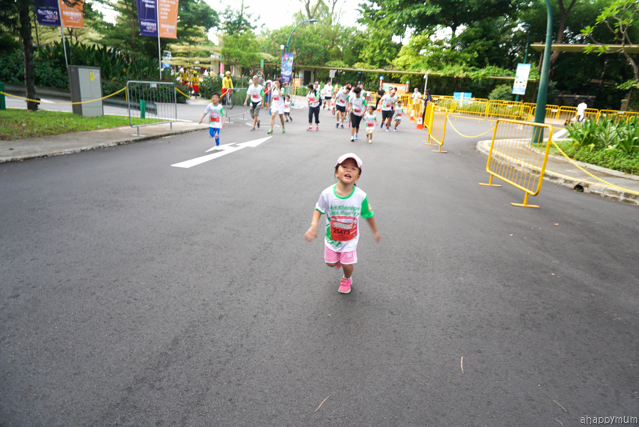 She was elated that she was going to run in the same race as her cousin and either though we lost sight of each other almost once the run began, at least they had lots of fun talking and taking photos at the starting line. So how far were we going to run? Well, 800m! I wanted to say just 800m but I reckoned what felt short to me might not necessarily be so to my kid. Still, it wasn't the kind of long distance run that we had done before and I wanted to spur her on in the hope that she would run from the start to the end on her own without stopping. 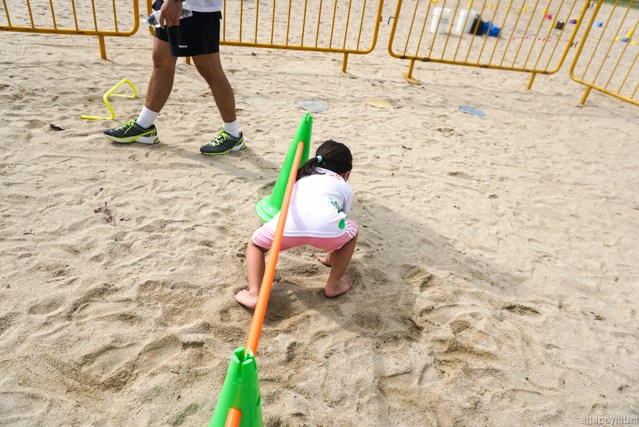 Thanks to the wide running route, it was easy for us to overtake others without needing to stop or slow down our pace. The only thing was my darling decided to dash and then slow down, dash and then slow down, which in my view wasn't the best way to run and so I suggested for her to run at a consistent pace and keep it up all the way instead. This was met by half a minute of protests and whines but luckily, she did listen to me and even though I had to hold her hand for a while to set the pace, she was soon able to do it on her own and we ran side by side, just me and my little girl. She kept turning her head back to see if she could spot her cousin but alas she couldn't and we just had to move on. She also saw a handful of kids who asked their daddies and mummies to carry them but never once did she ask me if she could have that. Awww, you did well, baby girl. As usual, I did a lot of chanting and kept repeating words like "You can do it! ", "Come on", "Let's go, baby, let's go", "Jia you jia you", "Almost there, keep it up!" and so on and so forth. Basically, I think I never stopped talking. Haha. But how long do we need to run 800m, right? Thankfully, not long and once we passed the halfway mark, the second half seemed easier and we were attuned to the pace. 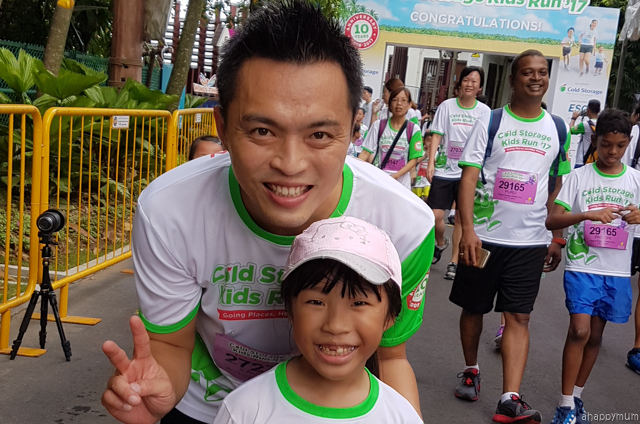 The girl was very excited to pass by landmarks such as her favourite Kidzania and I must say running in Sentosa was really a welcome change of venue. 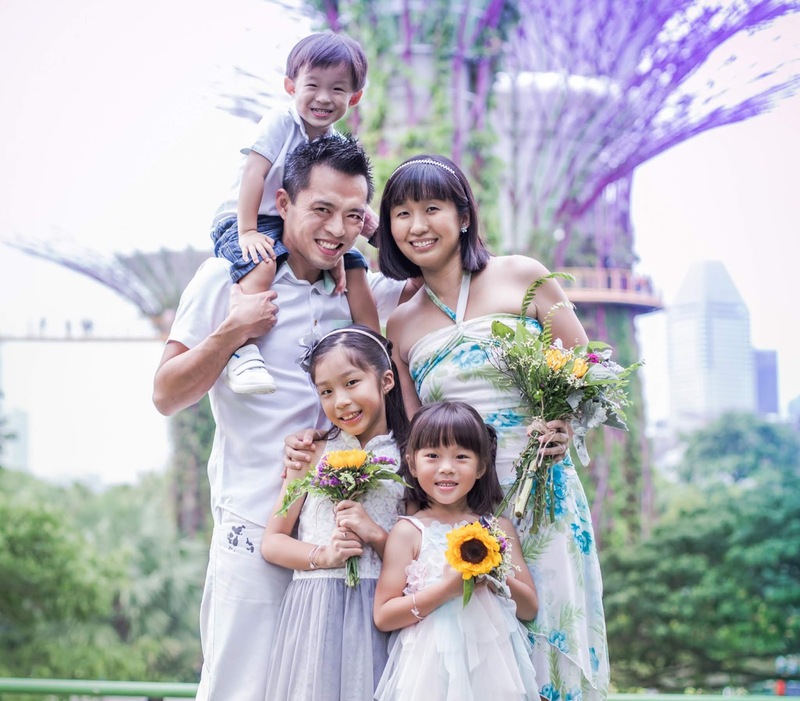 In fact, I hope they hold it here every year (we will remember to park our car in VivoCity and take the monorail over instead)! Anyway, as usual, I wanted to focus on the run instead of being distracted by the camera so other than the one picture of her running above, we didn't take anymore until we crossed the finishing line. A job well done and a medal well deserved, my girl! 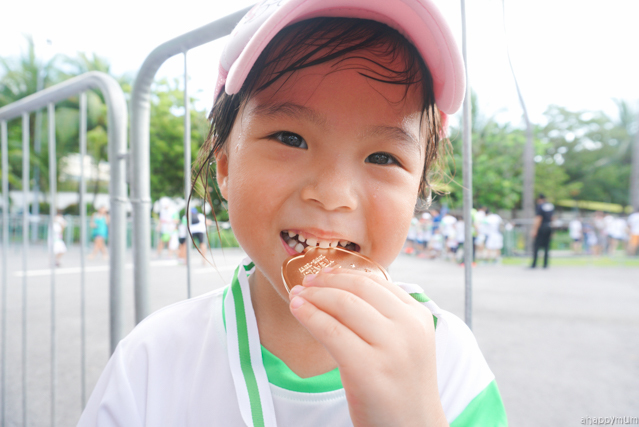 She was very happy to put on the medal and she knew that she worked hard to earn it. At that moment, it felt like she wasn't my baby girl anymore and I was proud of her grit and determination. As for the big girl who ran in the Happy Grapes Family Fun run (for 7 and 8yos) with the daddy, I was surprised to see her back so soon and was told by the two of them that they ran fast, didn't stop, and completed the 800m run in what felt like under 5 minutes. See the pic they took above? 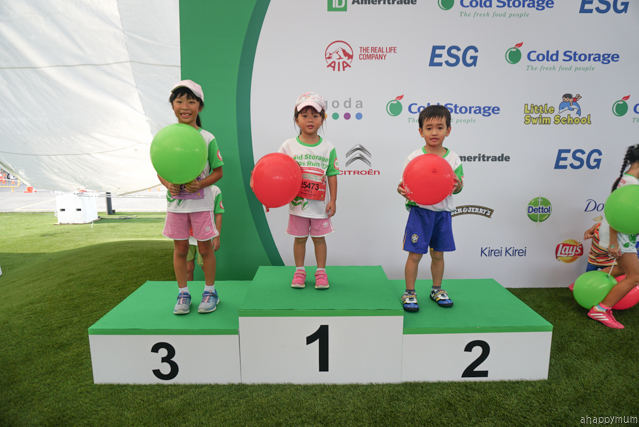 Yar, that was taken at the finishing line but how come it didn't seem like they got put in sweat and effort one (like I did)? Haha. Oh well, I've no doubt of this girl's stamina over the years and she's definitely a great runner than I ever was. Congratulations, my dear! You did so well too! Next year you will be on your own, okay? I promise to wait for you at the finishing line and capture that proud moment when you cross it. Yay! Two more medals to add to our growing collection! 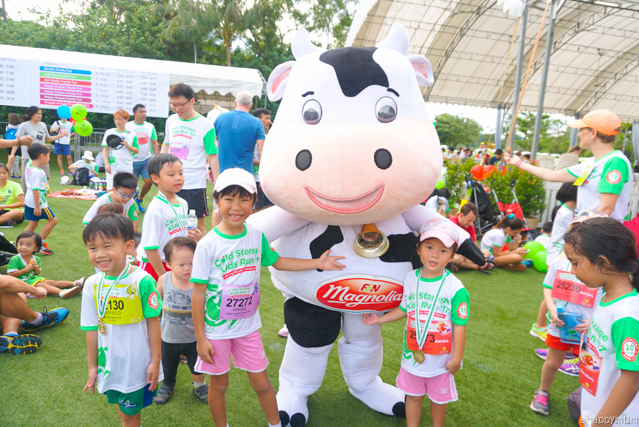 I hope we get to participate in many, many more kids and family runs in the future! So I was asking the girls to take some pictures with the adorable mascots who were walking by to interact and while the little sister was very excited to, the big girl seemed somewhat reluctant and only did so because we asked her to. It's another sign that she's growing up so fast and very soon, I gotta remind myself not to treat her like a young kid like I would towards her siblings, you know what I mean? 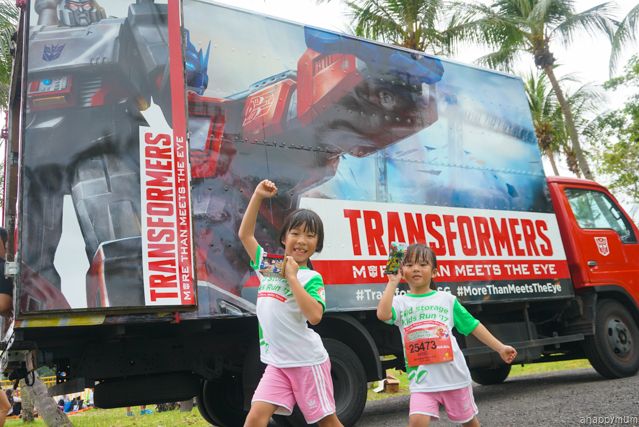 Anyway, we went off to check out the rest of the activities and were happily surprised to see the Transformers truck! What pleased the kids even more was that once I uploaded a picture of them with the truck onto social media, they could each receive a Transformers toy as a prize. How lucky of all these kids! 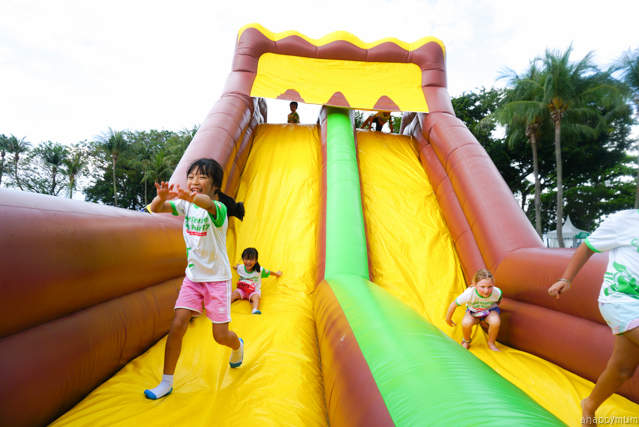 While all the older cousins were not keen on bouncy castles, which was the highlight of the kids carnival, both Angel and Ariel were very much looking forward to that and they had a great time sliding, climbing, jumping and playing whatever they wanted to play. 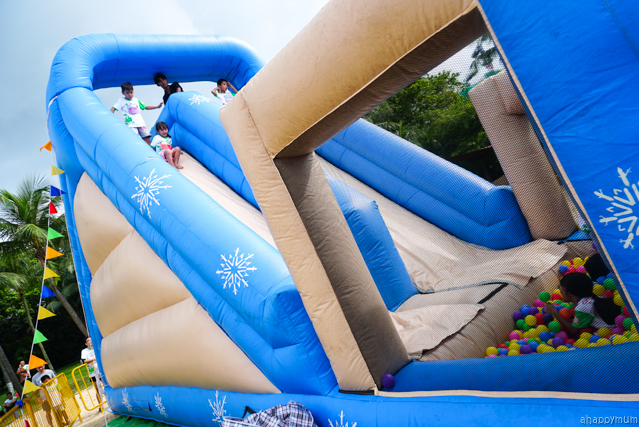 These inflatables look quite awesome, don't they? 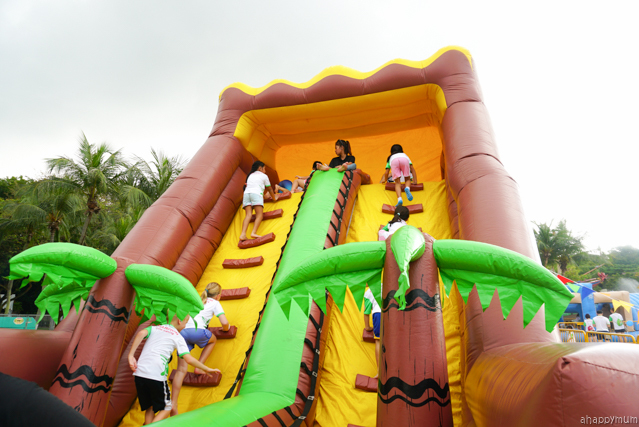 I would have loved to play on these tall, steep slides too if I had the chance to! I hope the girls will never grow out of loving to bounce, and even if they one day really do, I hope they will still go on it just so they can look after the baby brother who wants to play. Fingers crossed! 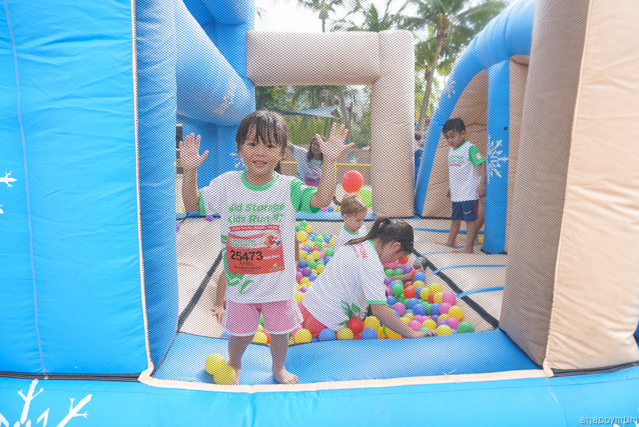 Besides the bouncy castles, there was also a mini obstacle game where the kids had to skip, crawl, turn rounds, walk backwards and shoot hoops in order to complete. It was all very fun just that we were also right under the very strong sun. Too hot, too hot! Usually, we would call it a day after completing the runs and playing some of the activities but this year was extra special. Why? 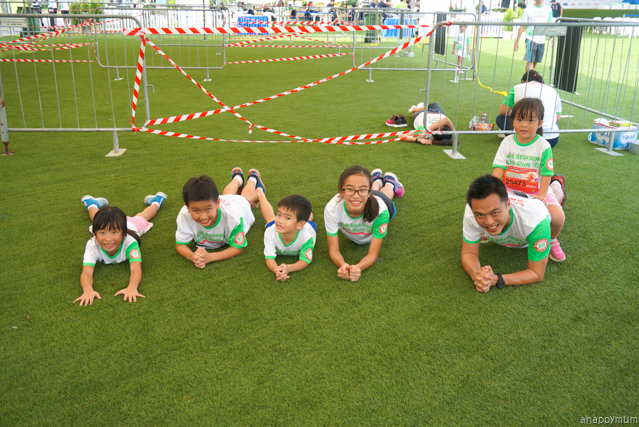 Well, the sporty hubby decided to conduct a kid-friendly sports session which saw them doing shuttle runs, leopard crawls, push-ups and even planking! 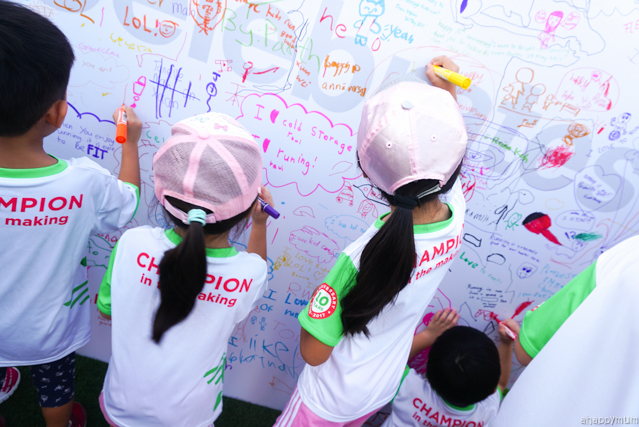 It was nice to see all of the kids coming together to laugh and have a good time while sweating it out. Sports is definitely one of the best ways for a family to come together to bond and it will always be. 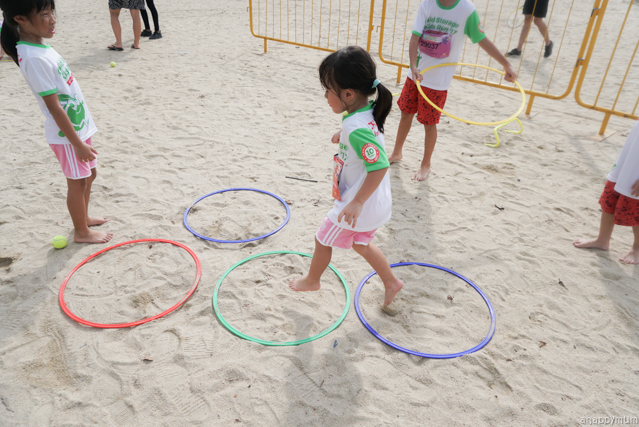 I hope we will continue to find chances to work out with the kids and have fun while striving for good health! 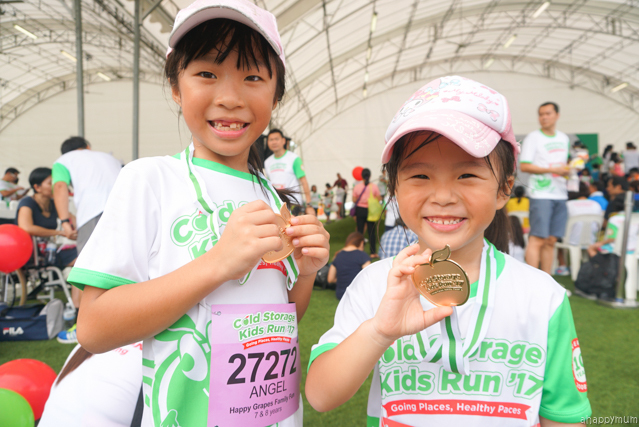 Till next year's Cold Storage Kids Run! 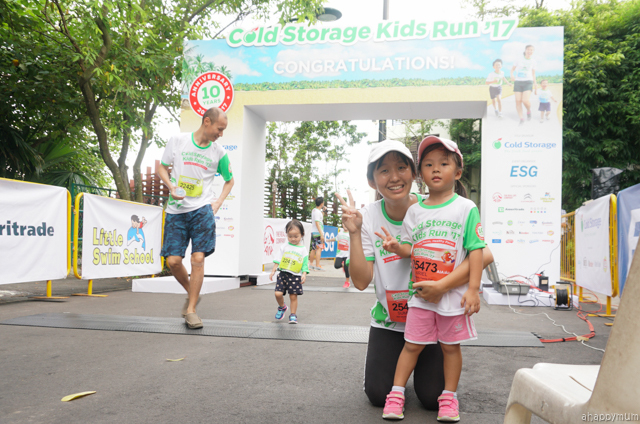 Disclosure: We received a media invite to participate in Cold Storage Kids Run 2017. All opinions are our own.